We want to extend our sincere thanks and appreciation for your ongoing support of Emma's Fund at North Carolina State University College of Veterinary Medicine to benefit epilepsy research in companion animals. Since the inception of this fund in 2007, Epil-K9 has contributed an incredible total of $45,000 towards Canine Epilepsy Research and Outreach during this 7-year period. Funding that has been raised and donated by families affected by canine epilepsy. Funding tat has truly make a difference in the past, and will continue to support advances in understanding, treatments and outcomes for pets and owners facing epilepsy. Moore SA, Muñana KR, Papich MG, Nettifee-Osborne JA. The pharmacokinetics of levetiracetam in healthy dogs concurrently receiving phenobarbital. Journal of Veterinary Pharmacology and Therapeutics 2011; 34(1):31-34. Schwartz M, Muñana KR, Olby NJ. Possible drug-induced hepatopathy in a dog receiving zonisamide monotherapy for treatment of cryptogenic epilepsy. Journal of Veterinary Medical Science 2011; 73:1505-1508. Schwartz M, Muñana KR, Nettifee-Osborne J. Prevalence clinical course and owner perception of dogs with cryptogenic epilepsy: 45 cases (2003-2011). Journal of American Veterinary Medical Association 2013; 242:651-657. Nettifee-Osborne JA, Muñana KR, Griffith E. Survey of owners' perceptions on the impacts of epilepsy and quality of life. Results presented at 2014 ACVIM Forum, manuscript in preparation. Waldron RA, Nettifee-Osborne JA, Muñana KR. Comparison of clinical outcome with zonisamide, levetiracetam or phenobarbital monotherapy in dogs with idiopathic epilepsy. Abstract to be presented at 2015 ACVIM Forum, manuscript in preparation. A pharmacokinetic study of extended release levetiracetam in dog with epilepsy evaluation whether the metabolism of the drug changes when it is given in combination with other antiepileptic drugs. A pilot study exploring the association between food allergies and epilepsy in dogs. Several of these studies have been undertaken by a resident or intern under the guidance of Dr. Munana. Your funding has enabled us to provide this critical research experience to our house officers. We also appreciate Epil-K9's support of our first Canine Epilepsy Symposium held in 2013, through speaker, publicity and materials provision. Our relationship with Epil-K9 has allowed us to develop extensive connections with owners all across the globe that would not have been otherwise possible in such a short span of time. 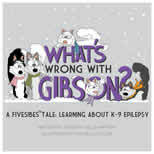 It has been an incredible journey for us, providing us a "front-row seat" to the changing status of pets with epilepsy, through the support of the Epil-K9 Foundation. As we begin 2015, we are continuing to research with the goal of advancing the understanding and treatment options for our canine companions affected by epilepsy. We are also hosting a Canine Epilepsy continuing education program for veterinary professionals in March, in efforts to provide veterinarians with the most up-to-date information on the management of epilepsy.